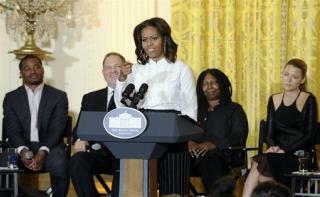 (Newser) – Sorry, potentially obese children of America, Michelle Obama has a new hobby. The first lady is taking up the cause of higher education access, particularly for low-income students, the New York Times observes, an effort that could come with a greater role in shaping policy. Today, she'll speak at Bell Multicultural High School in DC, preaching the importance of higher education and using herself as an example. Obama, the daughter of a pump worker, graduated from Princeton and Harvard Law School. "I'm here today because I want you to know that my story can be your story," We can all go to Princeton? "...and if you are a certain race you will be automatically accepted to most colleges and it will be FREE!" It should be illegal for any scholarships or government assistance for education to be determined by race/gender/etc. Economic need & grades should be the only factors money should be awarded on. Am I the only one who took "offense" at the way this article was written? I mean, I _thought_ journalists were supposed to write out the story as completely as they could so the reader could gather facts and decide for themselves what to glean from the story. This article begins with a slam at what was, and is, a legitimate concern (or should be!) to the adults of our country pertaining to the health of the children who will be the leaders of tomorrow...childhood obesity. To claim that the work Michelle Obama puts into these programs is nothing more than a "hobby" is an extremely insulting and misogynistic viewpoint for KEVIN SPAK to take! Besides the fact that he is apparently using words to sway people to his viewpoint, he is not "reporting" he is "giving an opinion". Granted, Newser _does_ print "opinions" but, it labels them as such so readers are prepared for what they are about to read...this was not so labelled.